SAP Business One is a complete solution, customized for Fashion & Apparel Manufacturing. It provides comprehensive functionality to manage your complete business. Manage complete lifecycle of a style, from creating style master, its costing, BOM and processes required. Define multiple colors, sizes, barcodes and tech packs for the style. Provides tools to help you efficiently manage your entire operations, including sales, purchase, manufacturing, sub-contracting, receipts and payments. Manage both your raw material and finished inventory across multiple locations with barcodes and bins. Plan your material needs and schedule your purchase accordingly. Complete set of tools to streamline your financial operations, such as maintaining ledger and journal entries, supporting tax calculations, and multicurrency transactions. SAP Business One Come with powerful analytics and reporting tools, so you can generate timely and accurate reports based on company-wide data. Product details and orders are synced with SAP Business One. Publish your app on Google Play Store / Apple iTunes. Designed and developed using latest technologies with various features for usability. Intuitive and easy to use, users can easily adapt without much training. Hosted on our secure servers to ensure uninterrupted availability. We can even customize the app to suit your specific requirements. SAP Business One is a single, integrated ERP solution that provides clear visibility into your entire business and complete control over every aspect of your business. SAP Business One is available in multiple languages and country localisations. SAP Business One with FashionNx covers various scenarios in Apparel & Footwear industry, including Make To Stock and Make To Order. FashionNx has advance and detailed manufacturing module for Apparel & Footwear Industry. 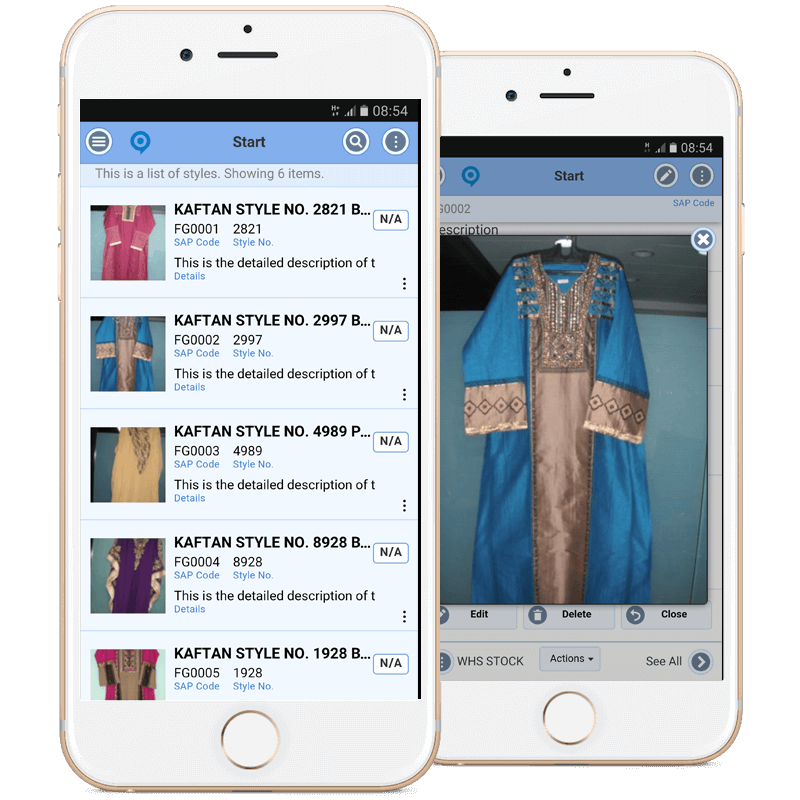 FashionNx lets you define operations and routings and gives you control through each step of manufacturing. Most critical aspect in Apparel & Footwear manufactuing is handling of colour and size variants. 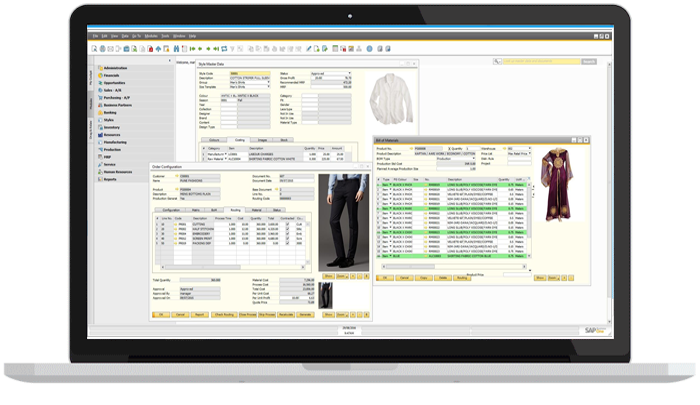 FashionNx uses MATRIX representation in Sales, Inventory and Production to represent all variants in same screen. With FashionNx you can use barcoding for tracking raw material, finished goods as well as various documents in process. It also allows you to use BIN MANAGEMENT for tracking inventory in warehouse. SAP Business One with FashionNx is available on both On-Premises and On-Cloud, you can choose the deployment method which suits you best, depending on your business requirements. Adapting SAP Business One with FashionNx today, will help your business grow faster and grow smoothly over a period of time. Today is the best time to buy an ERP. Call us today, to get a free demo.